My sister Whitney came and visited us last week. She wanted to meet our new little addition to the family! Gosh what a treat. She helped out in more ways than I can even say. Just having an extra set of hands was more than a relief. I'm going to be honest, the newborn stage is hard. I do love it, and I know it's such a fleeting phase, but it is still hard! Yep, I said it...being a mom is hard work! It's like my own mother once said, "nobody can prepare you for becoming a mother..."
But when all is said and done, I realized something the other day. Something that (for some reason) I hadn't ever given much thought to until now. It was simply this, that all things come to an end. The night time feedings and diaper changings will end. The "leaking" will end. The binkis will disappear and the swaddling will become something of the past. And, suddenly all these things that were exhausting me, and making me feel undeserving and overhwelmed became quite the opposite. Knowing it'll end has made me appreciate and endure it the best I possibly can. And, to me, that is an amazing realization! 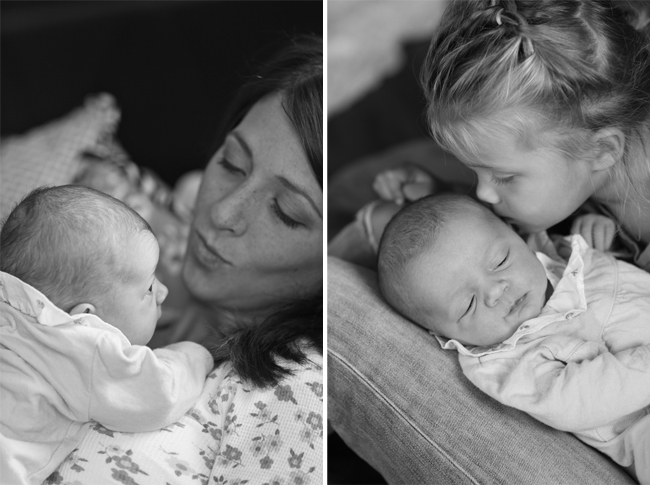 Whitney snapped these photos of me and my girls the other day while we were all hangin' out. In this photo below I didn't know she had me in the shot, I thought she was just close up on Cozette's face. I look a bit dazed and tired, the face of a mother with a newborn and two year old--a little exhausted and completely IN LOVE. My life is far from perfect or glamourous but I don't want it to be...where's the fun in that?! What precious children you have :) These photos are beautiful! I am at a very different stage, but one that you likely remember enough to give some advice. I am eight weeks pregnant (we haven't told anyone yet) and can't hold food down to save my life. Doesn't help that I'm a college professor...with lectures in the morning and labs in the afternoon...and canceling class every day isn't an option. Did you experience this (even a little bit)? If so, any advice on how to stay positive and make it through? congrats btw...what an exciting time!!! These are so beautiful. It is amazing how one day, you are so tired from waking up and feeding the baby and running around with the toddler. Too soon, the baby will start becoming her own and you will have two little wonders flying about your house! Our littlest will be 7 months very soon, he is so ready to move and moving at such a fast pace, I'm trying to savor the baby moments before they are all gone! So sweet though... Sleep well love. I saw something a few weeks ago that really resonated with me and might with you... I saw a suggestion that we add "for now" to statements about our current lives. My baby wakes up in the middle of the night for now. I have to rock my infant to sleep for now. "For now" gives us the hope of this too shall pass and the reminder to be thankful for where we are because it won't be this way forever. I thought this was simple, beautiful, and helpful. oh my beautifully said...I LOVE THIS! Thanks for sharing! What an amazing time in your life. So happy for you and your family. When you get a chance, come over and check out the Food and Wine Magazine Giveaway I'm having! I really need to take more pictures of my with my kids. I NEVER do. It's always just the kids or Byron and the kids (because I'm taking the pictures). I am absolutely in love with that picture of you looking at little Cozette... it seriously makes me start to tear up the way it just captures the look of a mother's love. Wish your sister was here to be my photographer! what a beautiful post. loved it!! beautiful post aarean. thanks for putting things into perspective for me today. and your girls are to die for cute. I love her, I love Sage and I love you. Thanks for having me... until next time.................... sadly. Favorite post so far. Nice work. You're pretty. What a beautiful post Aarean...congratulations again! Love the photos. These pictures are all so beautiful. I'm so glad things are working out so well with the new baby! Love the pictures. Adding the 2nd kid takes some getting used to. Soon they will be running around together. Congratulations on your new beauty. I love that first picture, such a real moment captured. Newborns are hard. I haven't had one in awhile, but I can still remember how delirious I felt and that I could ACTUALLY survive on so little sleep! She looks just precious. Love this post. I completely agree with it & love your realization -- so true!! My 10-week old has already changed so much from those first few weeks... it's crazy how long things seem in the moment, but how quickly it all changes. Looks & sounds like you're doing a great job! !